The Cassini Orbiter's mission consists of delivering a probe called Huygens, provided by ESA, to Titan, and then remaining in orbit around Saturn for detailed studies of the planet and its rings and satellites. The spacecraft was originally planned to be the second three-axis stabilized, RTG-powered Mariner Mark II, a class of spacecraft developed for missions beyond the orbit of Mars. However, various budget cuts and rescopings of the project have forced a more special design, postponing indefinitely any implementation of the Mariner Mark II series. Cassini took a similar tour of the solar system as did Galileo, referred to as a VVEJGA (Venus-Venus-Earth-Jupiter Gravity Assist) trajectory. Several opportunities exist for Cassini to make observations of asteroids, although exact encounters remain to be determined after the spacecraft has been launched as it depends on the launch date. 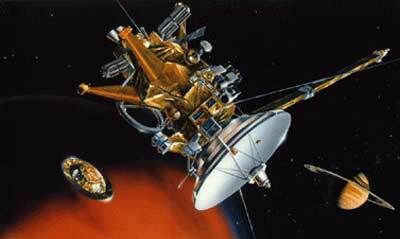 Cassini entered orbit around Saturn on 1 July 2004 after a 96 min burn of the primary main engine. Shortly after entering orbit around Saturn, Huygens will separate from the Cassini orbiter and begin its entry into the atmosphere of Titan. Cassini is then expected to make at least 30 loose elliptical orbits of the planet, each optimized for a different set of observations. Cassini's instrumentation consists of: a radar mapper, a CCD imaging system, a visible/infrared mapping spectrometer, a composite infrared spectrometer, a cosmic dust analyzer, a radio and plasma wave experiment, a plasma spectrometer, an ultraviolet imaging spectrograph, a magnetospheric imaging instrument, a magnetometer, an ion/neutral mass spectrometer. Telemetry from the communications antenna as well as other special transmitters (an S-band transmitter and a dual frequency Ka-band system) will also be used to make observations of the atmospheres of Titan and Saturn and to measure the gravity fields of the planet and its satellites. Cassini ended its mission on 15 September 2017, when it entered Saturn's atmosphere after 13 years in orbit. examine the physical state, topography, and composition of the surface. Huygens is a 1.3 m diameter descent module with a spherical nose and a conical aft section. A thermal protection aeroshell surrounds the descent module, decelerating it from 6 Km/s at arrival to 400 m/s in about two minutes and protecting it from the intense heat of entry. A parachute will then be deployed and the aeroshell jettisoned. 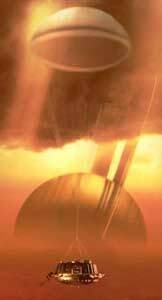 The probe will float down through the atmosphere making measurements. Huygens was separated from Cassini on 25.12.2004 and landed successfully on Titan on 14.01.2005. The probe transmitted images and data during decent and after landing from the surface. Huygens operated for about 2 hours after landing.